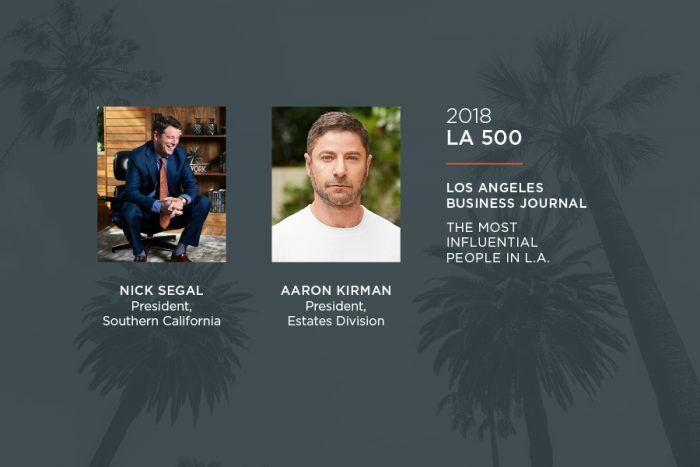 Pacific Union is proud to announce that Nick Segal, president, Southern California and Aaron Kirman president, Estates Division, have been named to the Los Angeles Business Journal LA500, a list of the region’s most influential business leaders in 2018. Over more than three decades in real estate, Nick Segal developed two real estate companies, DBL and Partners Trust, from the ground up. The firms were later acquired by Sotheby’s and Pacific Union respectively. As CEO of Partners Trust, he was named Realtor of the Year and received the William May Garland Award from the National Association of Realtors. His book, “On Your Terms,” co-written with his wife, Laura Segal, was published in June. 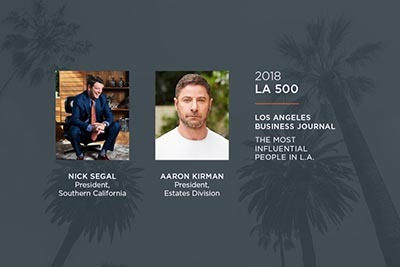 One of the leading real estate professionals in the country, Aaron Kirman works with an exclusive clientele that includes industry leaders, celebrities, royalty, major lending institutions, and foreign investors. He has represented such noted properties as Frank Lloyd Wright’s Ennis House, Richard Neutra’s Kaufmann Residence, and Frank Gehry’s Schnabel House. Recently Kirman received attention from national media outlets for winning the first $1 billion listing in U.S. history, a 157-acre parcel known as Beverly Hills Mountain. Last month, REAL Trends recognized Kirman as the No. 5 real estate professional in the U.S., with 2017 sales volume of $426 million.